What's the best Mac for video editing? Which is the best Mac to buy for video editors, iMac, Mac Pro, Macbook, MacBook Pro or MacBook Air? These are questions many of Mac users ask. All Macs can edit videos, but there's a huge difference between editing a video clip for YouTube and making a whole movie. Accordingly picking the right iMac, MacBook Pro/Air or MacBook for video editing for your needs matters as well. To make it easier and more efficient to edit videos on Mac, in this article we take a look at what's the best Mac computer for video editing, as well as the best video editing software for Mac to edit videos. Part 1: What the Best Mac Requires on Editing Videos? It's an accepted fact that all Macs can edit videos. The main difference is that some behaves better while some are worse on video editing. Why? That's because the differences of Mac configurations. So what the best Mac requires indeed on video editing? Editing videos places huge demands on processor power, graphics power and storage space. When you're editing video, for example editing YouTube videos on Mac, the processor is much more important than the graphics card. Video is very processor (and memory) intensive, especially if you want to edit HD or even 4K video. Here, it pays to get the fastest processor you can afford, with the most cores, and you'll certainly notice the benefit of a fast Core i7. Besides, editing video, especially high-definition video, eats up hard drive space, so make sure you have at least 8GB storage space reserved for video editing. MacX Video Converter Pro - An almighty video editing program, which applies all Macs (Macbook, Macbook Pro/Air, iMac, Mac Pro etc.). No problem to trim, crop, expand, merge, add srt subtitles/watermark on Mac OS X (macOS Mojave). Apple's new Macbook Pro for 2016, finally announced following a lengthy wait. Apple was starting to see dips in its revenue bottom line, adds upgraded processor chipsets ( 6th-gen Intel) and a rather lovely Touch Bar interface just above the keyboard. It's a lovely laptop and well worth the wait. Equipped with a professor of 2.7GHz quad-core Intel Core i7, Radeon Pro 455 with 2GB of GDDR5 memory and automatic graphics switching, 512GB storage space, the 15-inch Macbook Pro is no doubt the best Mac for video editing for an extremely enthusiastic amateur. It's a common sense that professionals take iMac with Retina 5K Display to edit videos on Mac. All of the video editing requirements (perhaps with the exception of storage) leads naturally to the iMac with Retina Display. 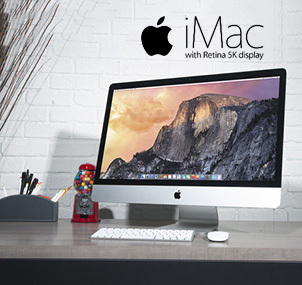 The base model of iMac 5K comes with a 3.2GHz quad-core Intel i5 and an AMD Radeon R9 M380 with 2GB of video memory. It comes with 8GB of RAM as standard, upgradeable to 32GB. You get a 1TB hard drive on the base model; up to 2TB Fusion Drive on the high-end model. And if you have enough money, you can upgrade iMac with Retina 5K Display to a better configuration, up to 4.0GHz quad-core Intel I7; an 3TB Fusion Drive, and a bigger graphics card - an AMD Radeon R9 M395X. What's more, it goes beyond just professor, graphics and storage. 5K Retina Display is a thing of glorious beauty. A test has shown that it displays 99 per cent of DCI-P3 color space with the highest contrast ratio. The iMac 5K is the perfect Mac for video editing because it enables you to edit 4K video at full size. There's no doubt about it: when it comes to speed and cost, you're best off with an iMac. After you pick the best Mac for video editing for your needs, choose the best video editing software comes next. But according to the different needs of editing videos on Mac, the Mac video editing programs can be divided into two parts: easy one for amateurs and complicated one for professionals. 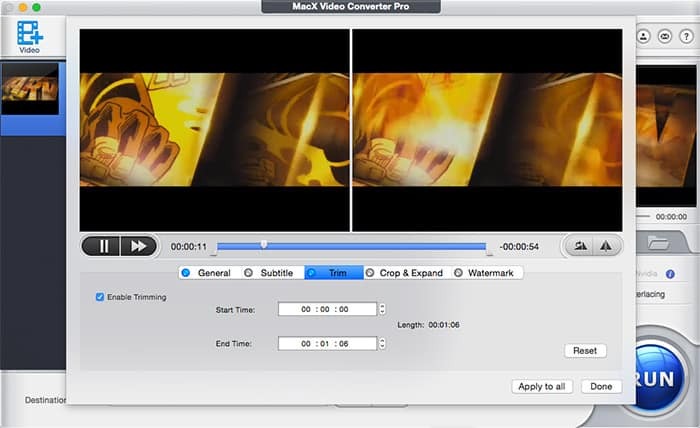 MacX Video Converter Pro is more known as a Mac video converter rather than a video editing software for Mac. But it does enables you to edit videos on Mac. You can merge several video clips into one longer file, trim and crop the video, removing the black bars in a wide-screen film or cutting videos into several clips for YouTube Facebook uploading. You can even add subtitles, so if you have recorded a family video, you can add some words you wanna say of SRT for the video. In addition to edit videos on Mac, you can also download YouTube videos Mac, or from 1000+ sites and convert video to MP4, MOV, AVI, MKV, iPhone, iPad Android etc. So if you find an interesting video online, you can easily download it for offline watching anytime and anywhere. Conversely, it's also a trifle to upload your recorded videos to YouTube, only if you convert videos to MP4, 3GP, FLV etc. and edit them to YouTube accepted videos. Compared with MacX Video Converter Pro, Final Cut Pro is a more complicated video editing software for Mac, which is more suitable for professionals. The Social Network, John Carter, 300 and No Country for Old Men are all big-name films cut on a Mac using Final Cut Pro. It is a non-linear editing tool, which allows for immediate access to all audio and visual content at any time and allows video editors to make infinite changes. Apart from the great features such as movie trailer, one step effect, audio editing, etc., you can share your movies to YouTube or export videos for your iPhone, iPad, etc. When getting started with Final Cut Pro, you will find it hard to master this video editing software for Mac. Anyway, you can learn more video editing tips and tricks at How to Edit Video with Final Cut Pro. Well, for common users simple editing features like trim, crop, merge etc. are enough for video editing without strict limitations of Macs. So here we'd like to share you how to edit videos on Mac with MacX Video Converter Pro even if you don't have the best MacBook or iMac for video editing. Step 1: Free download the video editing software for Mac (It runs well on Windows as well) and launch it. Then import the target video by drag and drop, or clicking "+" button. Step 2: Click "Edit" button to enter video editing interface, where you can trim, crop, add subtitle, add watermark for your video. Then Click "Done" button to save your settings. Trim: Check the box of enable trimming, and set the start time and end time as you like. Crop/Expand: Check the box of enable crop, then adjust the border distance of left, right, top and bottom. Add Subtitle: Enable adding subtitle and here are two options for you: pick the proper built-in subtitle or add the external soft subtitle of .srt format. Add Watermark: Enable to add watermark by checking the box, then typing the watermark words, you can move the watermark to anywhere on the video. Merge: Go back to the main interface and choose the videos you wanna combine together. Choose the status Merge All "On". Step 3: Click "RUN" icon to start editing videos on Mac with this beginners' best video editing software. Finally, Which is the best Mac for video editing? And which Mac video editing software should you choose to edit videos on Mac? That depends on whether you're a professional video editor hitting deadlines or an extremely enthusiastic amateur. If you are willing to render video then you'd go to 27-inch iMac with Retina 5K Display and Final Cut Pro. 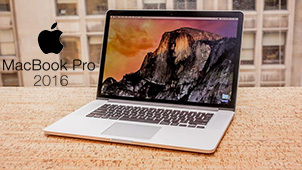 Macbook Pro with Retina display is also a good video-editing machine, enabling you edit video on the move with the help of a simple video editing software like MacX Video Converter Pro.